Saw this challenge come up and for some reason this came to mind immediately. Actually bought a kermit doll on ebay just for this shot. He was poseable so he made a great model. Hilarious. Imitation is the sincerest form of flattery? Message edited by author 2007-04-24 09:06:14.
you seem like a master at lighting! I can't believe I didn't comment on this earlier, its a fantastic image and one of the few that I think of when I think of DPC - a classic! Oh my gawd, this is totally hilarious! Fantastic idea, and very well executed. IMHO, this should have won the blue ribbon. Not only is this image executed to perfection, but it manages to lift my spirits every single time I look at it... which is often. Very funny and well executed. That is really great. Best of the lot as far as I'm concerned! Superlative in every way, title included! How could you even hold still to shoot it? LOL. Very funny...very cool. Well done. ahaha this made me laugh out loud! i LOVE it! my favorite of them all. This was/is bloody brilliant! Congrats on your 12th place finish - I had this pegged for a ribbon. Fantastic!!! I love this shot, my favorite for blue, well done and very, very funny! I just love this...so cute...but I hope his finger doesn't smell like 'Pork'...oh my...lmao!! Congrats for top 20. Very nice Tim!!!! Congratulations on your 12th place finish! Good to see one the funniest parody in the upper part of this challenge. Congratulations on your top 20 finish. I can't believe this only got 12th! A masterpiece! Dude! Congratulations! You're hereby kicked out of the Middling Masses... :-) This was one of my favorites! Dang! Ok I will give this green guy the Blue in my books! Great shot! 10 for creative thought processes. nice job. Just toooooo funny!!! Great lighting and execution. I think you got the angles just perfect on all but the hand at the bottom. That being said, I find this photo absolutely amazing, both in quality and in humor. Brilliant Idea. Executed Wonderfully. 10. This is completely hysterical! ROFLMAO. 10. I can't stop laughing... I just saw the "orig" earlier today... THIS IS GREAT! Great parody! I hope others remember original. Haha, I love this one. The lighting is awesome and it brings a good laugh. Wow great shot, this is so prefect! Excellent use of light and concept! So far, this is the funniest thing I have seen in this challenge. the lighting and sharpness are astounding. I love it .. this is fantastic and the body is almost just as good! 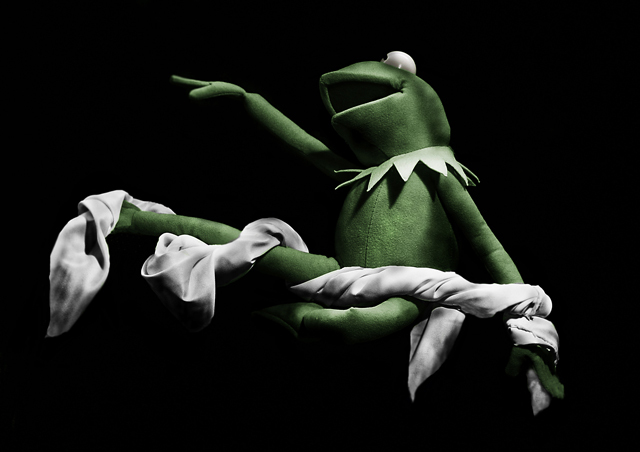 Well I love Kermit, and I love this image!! Classic! I LOVE it! Lighting and froggy set-up are perfect! Did you have problems with the tape keeping up your lighting and background (like Nico did)? I'll only give you a 10 if you did. :-) Great shot! Too funny! And very good rendition, lighting spot on. Although, Kermit is not nearly as yummy to look at as Nico. This is great!!! I knew the original right off the bat!!!!! Love it!! ROFLMAO!!! This is priceless! Well done! Lighting, pose, everything is spot on... Bumping up. omg this is hilarious! you put a great twist on the original. wow ... that's hillarious! well done. Hilarious! The pose is as accurate as can be for a frog. THAT is CLASSIC! LOVE IT! HA HA HAH.... oh man did I laugh when I saw this one! Really great! AHAHAHAHAHA!!! That is the funniest thing I have ever seen in my entire life!! 10 10 10 10!!! That is way too funny, I have to give you a 10 for this shot! Proudly hosted by Sargasso Networks. Current Server Time: 04/18/2019 11:16:34 PM EDT.